Whilst at Amelie's school nativity last week, I bought two strips of raffle tickets to raise funds for homeless pregnant women at Christmas. Apparently two quid will keep them in myrrh for a month. Sadly, they didn't draw the winners while we were there, but when I got home from work the following day, I was greeted with the news that I'd hit the jackpot. I'd actually won two prizes. Mainly because no one else entered. The first was a Cadbury's selection box, and the second a bottle of wine. Unfortunately they gave them both to Amelie to bring home, so by the time I returned from work, there was hardly any chocolate left. Frankly I was lucky she wasn't drunk as well. Lisa snapped up my Crunchie, which meant that by 6pm, my jackpot prize amounted to a finger of Fudge. It was just enough to give my kids a treat. But I ate it myself instead. Fortunately, neither Lisa nor the children drink alcohol, which meant the bottle of wine was untouched, which was handy as Lisa had already stated her intention to give booze to Amelie's teacher for Christmas. The woman could probably do with a stiff drink after a term with our daughter. Naturally I saw an opportunity to save myself some money, so in the spirit of Christmas and goodwill to all men, I offered Lisa my free bottle of wine. Unfortunately, she saw me as a gift horse and looked me in the mouth. At which point she insisted on researching my freebie online before agreeing to pass it on as a gift. The wine in question is 'Canti Vino Bianco', canti being Italian for songs. Presumably of the drunken, offensive variety. I assured Lisa that it must be top quality, as surely no one would donate anything but the best to a school raffle, but she chose to look it up online nonetheless. She found this review. Which is not what you'd call glowing. In addition to describing the wine as bland, the reviewer states that "there is a distinct whiff of eggy sulphur above the glass which at least does serve to warn the pallet of the assault that is to come". They should read that out at AA meetings to help people cope with their cravings. It's certainly put me off having a drink. So the upshot of all that is that I had to drive my family down to Asda last night to buy some decent wine for the school staff. I also bought some wellies which I didn't realise I needed until I saw them. 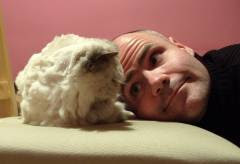 It was the same with the Hello Kitty hat I bought for Amelie and the zebra night dress for Lisa. We eventually returned home at seven-thirty, well past Toby's bed-time, at which point Amelie, who'd received at least three impromptu gifts from Asda, decided to play around at the front door and pretend to be invisible. Despite the fact that I can usually see straight through her, on this occasion I refused to play ball on the grounds that she was late for bed on a school night and we needed to get in. Which prompted her to stomp indoors in a huff. 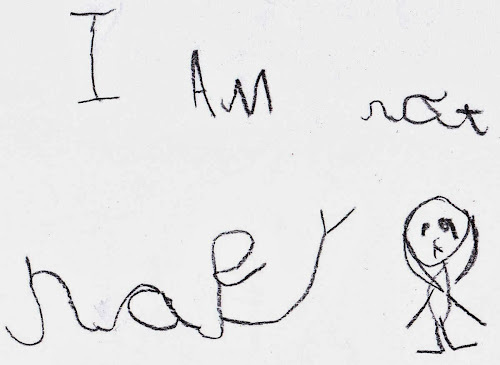 Obviously I'd like my daughter to be joyful and contented with life, but the fact that she can write "I am not happy" in joined up writing before she's five-and-a-half, is something I'm immensely proud of. Yes, I don't think you could do that at her age. opinions. Great website, stіck wіth it!